While reading through the sites in my feed reader yesterday, a headline from Universal Hub caught my eye. Wait, somebody actually reads the comments at the bottom of Globe and Herald articles? The master of enticing headlines strikes again. Since I’m one of the, apparently, few people who do read the comments at the end of Globe and Herald articles (some of them are actually informative and sometimes downright hilarious), I had to read the whole article. But you know what, Doug? Your pals at Morrissey Boulevard and Herald Square share the blame. They haven’t set up forums for intelligent discourse on the events of the day. They’ve set up the digital equivalent of blank sheets of paper taped to the wall above the urinals in men’s rooms. Of course people are just going to scribble and rant. Real community – and the intelligent discussion that goes with it – takes real work. And real community is a two-way street – people react differently when they know somebody is on the other end of the ether. What do you expect is going to happen when people realize there’s no there there? Compare the rantings on your typical news story with either MetaFilter or, locally, the BoMoms forums (so somebody at the Globe does get it). Absolutely true. The Globe and Herald simply don’t respond to many of the comments written on their sites. They do moderate the comments, so what you see has been approved by someone at the papers and thus they share the blame for the quality of comments posted there. I know that comments are moderated because I’ve written comments on both sites, some get published, some don’t, but they all enter a queue for moderation. Just a few days ago, I spotted that the Globe made an error while reporting on a fire in South Boston. 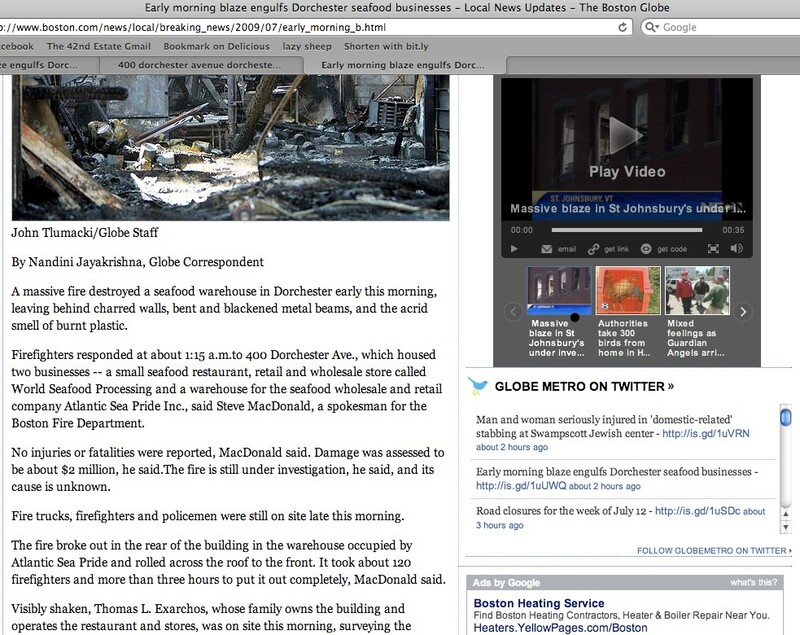 The error was that the Globe reported the fire happening in Dorchester, most likely because it was on 400 Dorchester Avenue (which extends not only into Southie, but also into the downtown core, past South Station). After tweeting about the Globe’s mistake (which normally I would write off as simple human error but since the Globe’s headquarters are in Dorchester, you’d think they’d know better) I then proceeded to write a comment on the Globe’s site informing them of their mistake. Within a few minutes, the Globe started changing the information on their article. At first it was just the headline, then a few minutes later the article body, then a few minutes later the meta title was changed too. Nowhere during that time period, nor now, did my comment appear. Could it have been sheer coincidence that minutes after posting my comment about their mistake they noticed their error and began fixing it? Sure. More likely, in my opinion, is that the Globe didn’t like the one snarky line I put in the comment stating “you should know better, considering you’re based in Dorchester” and decided to just make the changes and hope no one called them out on it. If you make a mistake online, don’t try to hide it. It wont’ work since people take screen shots and tons of services store caches of your web pages. Instead, admit the mistake, fix it, and notify your readers of the error and the correction. But not getting credit for my editing fix isn’t what bugs me, it’s the lack of transparency and communication. The ideal method would have been for the Globe to post my comment, respond to it saying they’ve fixed the mistake, then crossed out the original location and replaced it with the correct one. That way there’s transparency, a paper trail, and the commenter gets rewarded and encouraged to continue commenting. Mere minutes after submitting my comment, location is fixed. To anyone thinking I manipulated these images. Here’s a tweet from the Globe on July 11th marking the fire in Dorchester, then a day later another tweet from the Globe marking the the fire in South Boston. What really gets me going though, is that the Globe was not the first publication to report on the fire. 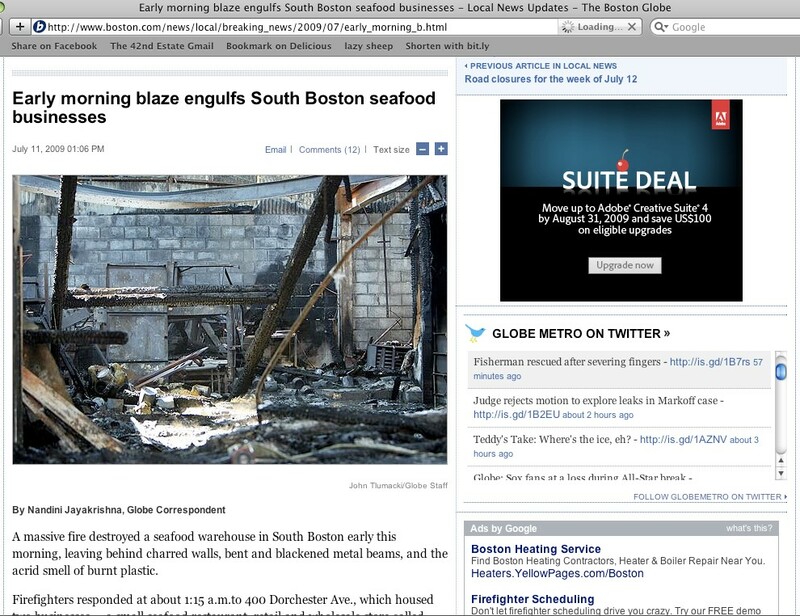 Other publications had reported on the fire with the correct location hours before the Globe ran their version of the story. A simple Google search, followed up by checking Google Maps would have allowed them to catch the mistake and not require me notifying them via a comment. The Boston Globe comments don’t fail because web comments are dumb and vain, they fail because the Globe doesn’t understand web comments. They moderate comments, yet a lot of junk gets through, they don’t respond to comments, and they don’t reward their commenters. Those three conditions combined together add up to comment fail for the Globe. We know that newspapers made a mistake and devalued their product by giving it away for free on the Internet. Some rebuilding could begin by removing these reader forums and restoring journalism’s dignity. It’s a downright silly suggestion, as comments provide a venue for readers to add to the article, and as in my case fix the mistakes of the newspapers. Bailey goes on to note that journalists “…work hard gathering information dutifully trying to raise the debate on issues or inform the public on a burning topic…”. So, according to Bailey, the whole point of journalism is to inform and inspire discussion, yet because he doesn’t like the discussions that are happening we should shut off the valve. That’s ridiculous. It’s not the fault of the comment system that the comments aren’t filled with in-depth discourse, it’s the fault of the comment administrators who don’t respond to comments and decide to post some mis-informative ones while ignoring other informative ones. Don’t blame comments Bailey, blame the Globe and Herald. You can find plenty of intelligent comments on the web, but as Adam Gaffin noted, it requires hard work to build a community and ensure the comments released through that community are quality. Participating in the discussion after the article is published only serves to strengthen the quality of comments. Otherwise you’re left with a mess of one-way rants and shouts from the article and the comments. Thanks to Nima for the Fail Stamp picture. I didn’t buy Bailey’s premise — are newspapers supposed to hide from the online community? But, if I were to say, OK, that make sense, couldn’t the same argument go for letters to the editor? We only see a portion (in this case an editor, like a moderator, selects what we see) and some letters are well thought-out and well written. Others can sound related to the “uniformed” posting Internet comments. Allowing the “unwashed” to comment on “pristine” journalism might corrupt the mission of journalism (btw, I don’t believe that), but at this point, the Globe needs to try a lot of things if they want to survive. Hiding from the online community is exactly what the newspapers shouldn’t do. I’m sure you’re aware of the brouhaha over whether Google News is violating newspapers copyright (they aren’t, it’s fair use) by quoting 2-3 lines from articles and linking back to the articles. Newspapers have been making a big fuss over it, but they can easily remove themselves from the Google search engine by placing two lines in their robots.txt file telling Google not to crawl through their site. What newspapers need to do is figure out what they want from the online community. Is it pageviews? Links? Comments? Or subscription revenues? Right now, they don’t really have a gameplan, they’re just throwing anything and everything against the wall and seeing what sticks. But because it’s not targeted, it’s not sticky and ends up falling off the wall. Once they figure out what they want to gain from the internet, they can actually go about taking steps to achieve that goal(s). Great point about the letters to the editor. It’s my belief that the goal of newspapers should be to report on and improve a community. By allowing readers to comment, it helps build that community and pulls in ideas that otherwise might never have seen the light of day. But, the Globe and Herald need to help build that community up. It won’t happen on its own. Allowing the “unwashed” to comment on articles keeps the newspapers on their toes and helps people use that information to improve the surrounding community. The Globe needs to either become just a soapbox for its ideas (bad, IMO) or dive in fully into developing a community around their site. They can’t go half-way, it doesn’t work. Ha, that’s good one. I noticed that your Tweetmeme button isn’t sending your Twitter ID, itssending the Tweetmeme one. Hmm, yeah I dropped the Tweetmeme plugin in favor of adding the code into my theme, need to take a look and see if I can add in my Twitter ID. Also noticed it’s not using bit.ly, which is my preferred URL shortener. It rocks and is well worth the invite wait. BAHAHHA don’t you just love it when people try and cover up their mistakes online. Don’t these people know better? I never understand how people are so stupid when it comes to this kind of stuff. Of course at this point I don’t have near the online community that you do, nor do I know if that’s really what I want for my blog, but I do know that pretty much unless the comment is spam it’s going to go up on my blog. Moderation is just that moderation. It doesn’t mean selective hearing in the discussion about a topic. Nice catch. Yeah, everyone needs to realize that once something hits the internet, it’s there perhaps forever. With the amount of services caching sites and people taking screen shots, printing articles, it’s best to admit a mistake and publish the fix. Having said that, I’m sure I’ve done similar edits before, but there’s a difference between me editing some non-important (in the grand scheme) post and a newspaper editing a news article. In the second case, your main goal is to inform, so if you misinform you need to let people know that there was mis-information, not just make it disappear. Very true about moderation Dave. If someone disagrees with me, that is not grounds for not publishing the comment. In fact, I welcome disagreement and other points of view as it strengthens the conversation. To back that up, my posts about socialized healthcare and the war on terror drew plenty of disagreements but all those comments got published. I love it when someone brings a different viewpoint onto my blog. The elitist in me thinks that a newspaper website is one of the few websites beside hotmail.com and myspace that a good number of people use, thus making newspaper comments a better barometer for the discourse of the general public as opposed to a barometer for the discourse found on “the internet”. New site design looks great, by the way! So, what does this say about our society in general Aaron? Is the majority of bunch of blabbering idiots or does the medium and the moderator play some role in the quality of comments? From my personal experiences, I’d favor the latter. I haven’t met too many people in real life who talk in the same manner as the YouTube comments. Does the perceived anonymity (no one is really anonymous) allow people to let loose, revealing a lack of substance? Or do the big sites draw troublemakers who write stupid comments because they know it’s one of the few places they’ll have an audience and will likely get a response too? @Aaron : agreed man. I try to focus on comments, but not for back links. I do it because the real conversation is there. Reading an informational article and having no way to converse about it, it ancient IMO. Want to know about Boston? Find a blogger who lives there and get real information..
Not allowing comments is IMO, detrimental. Without comments, the author is just on a soap box proclaiming his/her viewpoint. With comments, it changes into a dynamic place where discussion can be fueled and additional information brought in. As long as moderation is practiced, I really see no downside to comments. I agree, I do try to make sure that I let all commenter’s say what they want, as long as they are not spam. Your opinion is yours and you are allowed it.